"I want to kill. I mean, I wanna, I wanna kill. Kill. I wanna, I wanna see, I wanna see blood and gore and guts and veins in my teeth. Eat dead burnt bodies. I mean kill, Kill, KILL, KILL." Now that I've set the mood, we can now dig into our B movie blood, gore and guts. Obviously there's a market out there as the compilation of the various critics amounted to 74% on Rotten Tomatoes. That's a lot of interest for blood, gore and guts. A grindhouse is an American term for a theater that mainly shows exploitation films. It is named after the defunct burlesque theaters located on 42nd Street in New York City, where 'bump n' grind' dancing and striptease were featured. Grindhouse also refers to a 2007 film made by Robert Rodriguez and Quentin Tarantino. This double feature consists of the Rodriguez-directed Planet Terror and the Tarantino-directed Death Proof. These films were supposed to pay homage to the Grindhouse type of movie theatres and the B movie exploitation films shown there. And now for the funny part. Before each part of the double bill, Rodriguez and Tarantino showed trailers for fake films. One of those films was Machete. Yep, that's right. The start of the movie Machete was merely an amusing add-on to the original Grindhouse double bill. 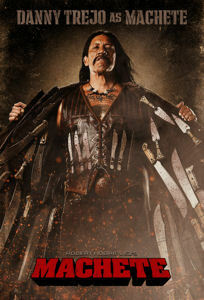 However, it seems that Rodriguez had written the complete script for Machete back in 1993 for the actor Danny Trejo after Rodriguez had made Desperado with Antonio Banderas; Trejo had a part in this film. So we have a script for Machete in 1993; a fake trailer for the film in 2007 and finally an actual film in 2010: an odd sequence of events for the development of this film. Machete is a B movie and it was deliberately made that way. Love it or leave it. Unlike something like murder mystery by Agatha Christie where we have essentially 1 murder for the entire film, Machete like, let's say, The Expendables attempts to quickly go through a body count on all of our fingers and all of our toes until we either give up or turn on the calculator function of our cellphone. No wait, we're supposed to have turned that device off for the film! In keeping with the B movie atmosphere, the opening credits have this graininess attributable to reel films. - Note that I said reel films and not real films. - Hmmm, with the advent of digital movies, I feel certain the concept of graininess is going to be quickly lost. How many kids are ever going to actually touch film? VHS is gone, CDs are being replaced by DVDs and Blue-Ray is here. Does anybody remember Super 8? Back in 1998, I visited a music store with my eldest daughter, picking up a couple of CD's as a birthday gift. As we were standing at the counter, my daughter looked up and asked, "What are those things?" I looked up and immediately knew what they were. Somebody had attached a series of plastic disks to threads and left them hanging over the counter as decoration. However, the funny thing about these disks is that they were the plastic disks you would put in the large hole of a 45 record in order to play it on a turntable which was not equipped to play 45's. I realized my daughter, 25 years younger than me had never seen in her lifetime a 45 record much less this plastic disk. Everything in the store was CD's; records were a specialty item and didn't really exist in the mainstream anymore. I chuckled in thinking about this; about how quickly technical innovation supplants the past. No spoiler alert here. Suffice it to say that Trejo is a former Federale who gets into trouble as an illegal alien in the U.S. in some dealings with a drug lord and a crooked senator. However, check out the cast. Tarantino as well as Rodriguez seem to be able to entice top talent to participate in these projects: Robert de Niro as the senator, Stephen Segal as the drug lord, Jessica Alba, Lindsey Lohan, Cheech Marin, Don Johnson and Jeff Fahey. We may be watching a B movie bit it seems like an A cast. Of course, both Tarantino and Rodriguez have so many good films under their belts, I am certain that actors want to work with them. According to the numbers, the budget for the film was $20 million and so far the film has grossed $25 million. In comparison, The Expendables had a budget of $82 million and has grossed almost $250 million. The budget of Resident Evil: Afterlife was $58 million and its gross stands at $240 million. But why not the mother of them all: Avatar: budget = $237 million, promotion = $150 million, gross = $2.7 billion. Yes, billion! At the very end of the film when the credits were starting, there was a promo saying, "Machete will return" then there was a full screen splash for "Machete Kills" and "Machete Kills Again" supposedly more fake trailers. However, who knows? If the studios think there was sufficient profit here, they could very well back another Machete film. When I saw Machete, I saw the trailer for this up-coming film starring Rutger Hauer. Remember him in Bladerunner as Roy Batty, the leader of the replicants? It seems that this film also started as one of the fake trailers shown along with Grindhouse. The makers apparently won some sort of trailer contest for Grindhouse and the trailer was shown mainly in Canada along with Grindhouse. Move forward to 2010 and the trailer is now an actual film currently in production. Ha, ya never know? I'm certain the novice filmmakers must be thrilled at the chance. How many of you reading this even know who this is? Let me set the scene. It's 1967. This is the era of the hippies: peace and love... man. The United States is in the middle of the Viet Nam war and man, is this being protested or what.